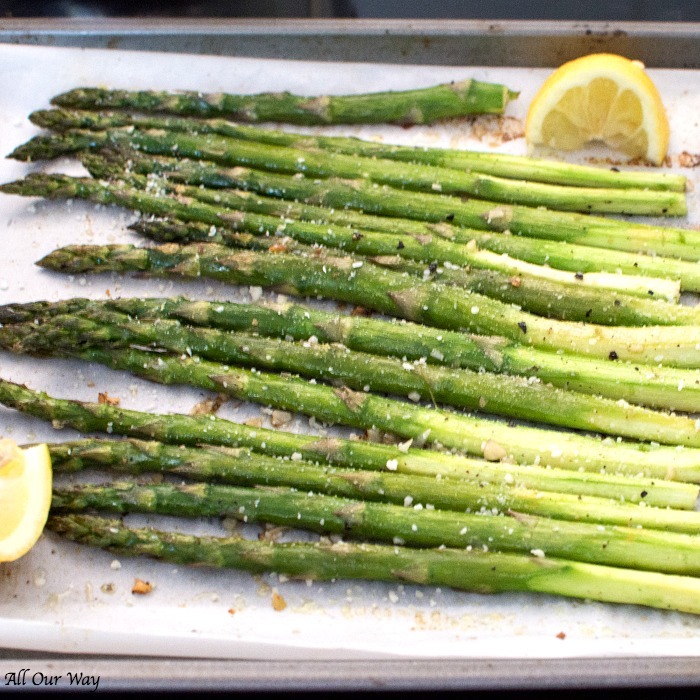 Lemon Garlic Asparagus with Parmesan is a quick and easy vegetable side that’s full of flavor. The combination of fresh lemon juice, minced garlic, and grated Parmesan is incredible. All you need to finish the dish is a sprinkle of kosher salt and a few grinds of fresh pepper. My mamma taught me how to clean asparagus. I thought she would go ballistic when she caught me wasting one-third of the asparagus stalk. It was Easter and I was helping her get ready for dinner; I volunteered to get the asparagus ready. After rinsing the bunch in cold water, I trimmed off the bottom. I took one stalk, bent it in half until it popped. “I’m cutting off the woody part of the asparagus,” I answered in Italian. We always speak Italian at home. No matter how long it takes, that’s still how I trim the asparagus stalks, piano, piano. There are people who will argue that it’s not worth the time. Put all those ends together and see how much you throw away. It’s such a shame to toss out those delicious ends. Once you get the stalks ready, all you need to do is mince the garlic and squeeze some fresh lemon juice. Preheat the oven to 400°F (205°C). Put the asparagus on a foil-lined baking sheet. 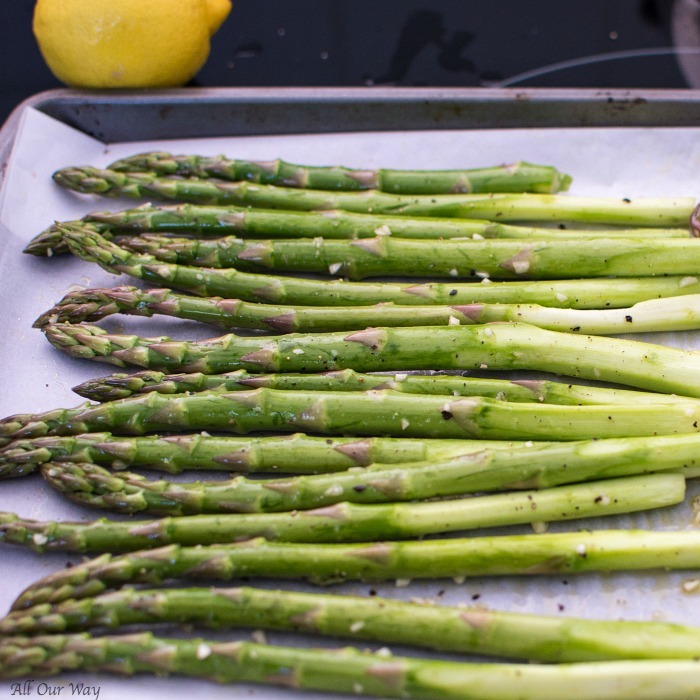 Drizzle the asparagus with extra-virgin olive oil, salt, pepper, and garlic and rub the stalks to evenly distribute. Sprinkle with Parmesan cheese and make sure they’re in a single layer. Roast for 10 minutes. Take them out and give the spears a small shake. Return the pan to the oven and roast for another 5 minutes more depending on the thickness. Squeeze a little more lemon juice over the asparagus before serving. I love adding lemon to dishes like I did in One-Pan Italian Chicken, or Lemon Garlic Roasted Mushrooms, or Grilled Shrimp with Lemon and Garlic. We served the asparagus with our new favorite fish dish, Baked Corvina with Lime Garlic Butter and Peppers. Be sure to take a bow when your family raves how delicious the roasted lemon garlic asparagus turns out. A quick and easy vegetable side that is loaded with flavor. The hint of lemon gives the asparagus a bright fresh note that is reminiscent of spring when the asparagus is most abundant. Preheat oven to 400 F. (205 C. ) As the oven is preheating rinse the asparagus in cold water. 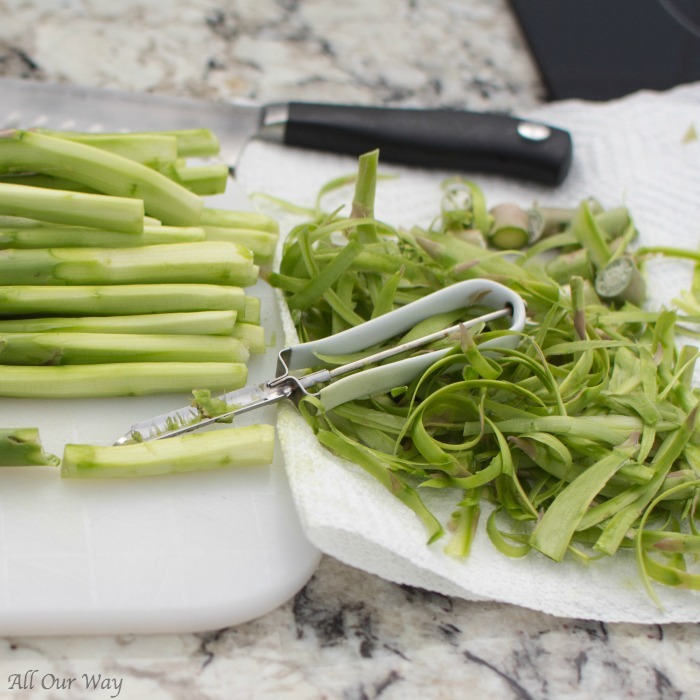 Trim the very bottoms of the stalks then use a vegetable peeler to peel away the tough outer skin of the ends. Line a baking sheet with foil and spray the foil with vegetable oil. 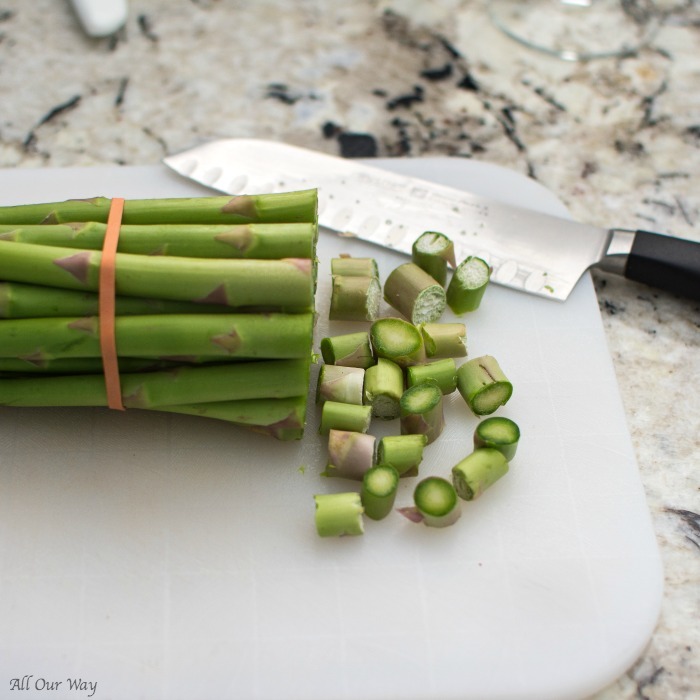 Arrange the asparagus in a single layer on the baking sheet. Drizzle the stalks with olive oil, and sprinkle with the salt, pepper, and garlic. Squeeze half a lemon over the asparagus. Rub the spears so that they are evenly coated. Arrange them again in a single layer. Bake in the preheated oven until just tender about 12 to 15 minutes. Take the asparagus out and give the baking sheet a little shake or use a spatula to rearrange the spear. Return to the oven for 5 minutes more. Squeeze the other lemon half over the asparagus and sprinkle with a little more Parmesan if desired. Keep an eye on the asparagus because depending on the oven and the size of the stalks they may get done sooner or later. They are done when they are just lightly browned and tender when pierced with a fork. Note: Recipes and content from ©2017 All Our Way are copyright protected. Please do not use content or recipe without prior written permission. If you want to share the information, please link to this post. Grazie. Such a perfect fresh side dish! I love your mom’s trick about peeling the bottom parts; that’s brilliant! I absolutely love asparagus, especially with lemon, but I’ve never roasted it before, can’t wait to try this recipe! I love asparagus so this is the perfect recipe for me, Marisa! Can’t wait to try it! Thank you, Agness! We are so happy that asparagus is in season — we sure are taking advantage of it. Have a great week. We LOVE asparagus in our house. Just love it! We do too, Sasha! And to think this recipe is so easy to make! My sister and I LOVE to find new ways to make asparagus. I’ll have to surprise her with this when I go visit her next. What a nice surprise it will be, Kitty! We’ve had the asparagus like this four times already in two weeks – we’re not tired of it yet. Have a nice weekend. ? I love this season because roasted asparagus is one of my favorite veggies! love the addition of the parm cheese to make this simple but classy! Hi, Kristen! We had it again the other night and I’m still not tired of it! Roasted asparagus is a very special treat, indeed! Thanks for the tip! I will use it starting today!! Ciao, Annie! You’re welcome. We had roasted asparagus last night. It was so good! I’ve always had a hard time with Asparagus because of it’s bitter taste, but your recipe looks DELICIOUS! I feel like the parmesan, oil, and seasoning would make it taste amazing. Must try this recipe soon! Hi, Christine! 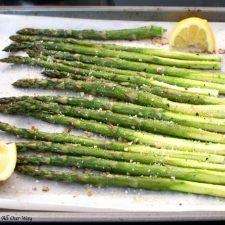 I believe roasting the asparagus sweetens it up and the lemon gives it just the right taste along with the garlic and parmesan. If you try it, let me know what you think. Marisa, I saw your asparagus on IG and it’s even prettier here on your blog. Believe it or not, I have never cooked asparagus before. I’ll give it a try along with you easy stalk-prep tips. Hi, Lisa! Thank you! I think you’ll really like making it this way. It gives the asparagus a sweeter flavor than steaming them. 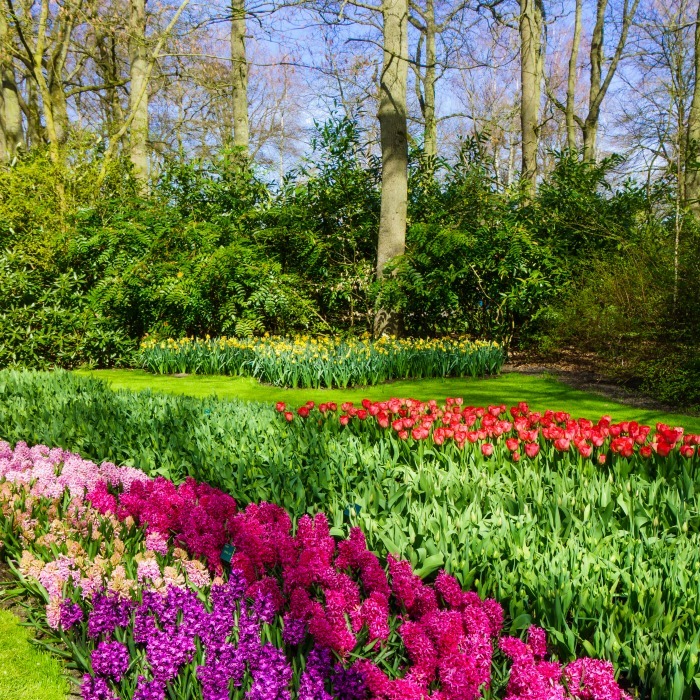 Hope your spring is starting out great! Hugs!! Thanks again for the tip, and this recipe! Hello, Renz! Shaving the stems makes all the difference. Happy Spring!! I had no idea about peeling the bottoms of the stalks and I’m so glad you mentioned it! Love the flavors of this side – asparagus is one of my favorite vegetables and I always look forward to eating lots of it in the Spring! Hello, Amy! Shaving the bottom does take a little bit of time but it’s worth it by not wasting any of that delicious stem. Wow this Lemon Garlic Asparagus look amazing and so easy to make. Love the fact that now are in season so we can find these very easy. Hello, Adriana! Hope you try out the recipe. It’s easy and turns out so good. That’s exactly what I do! And for the se reason!! What a lovely Spring side dish! 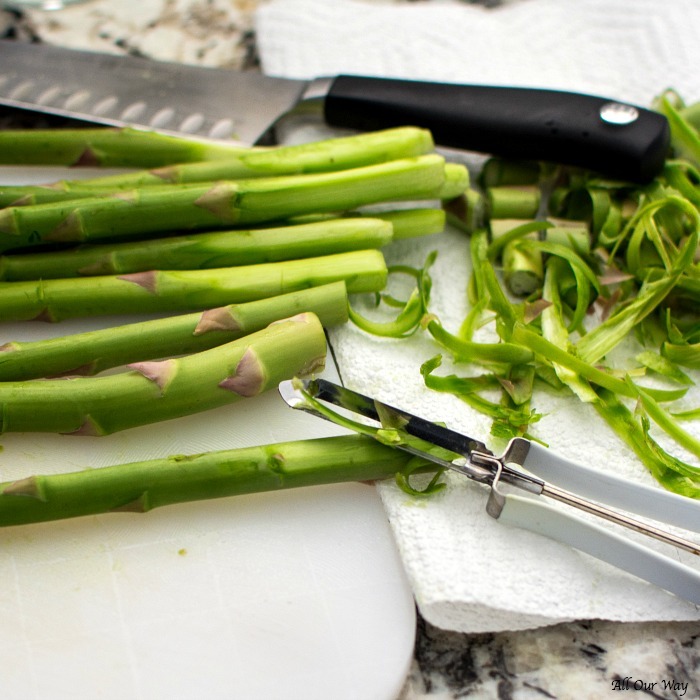 Great tips on how to prepare asparagus too. Hello, Kathryn! If it hadn’t been for the asparagus, I think I would have welcomed spring in with fresh peas. Lovely flavor combo. 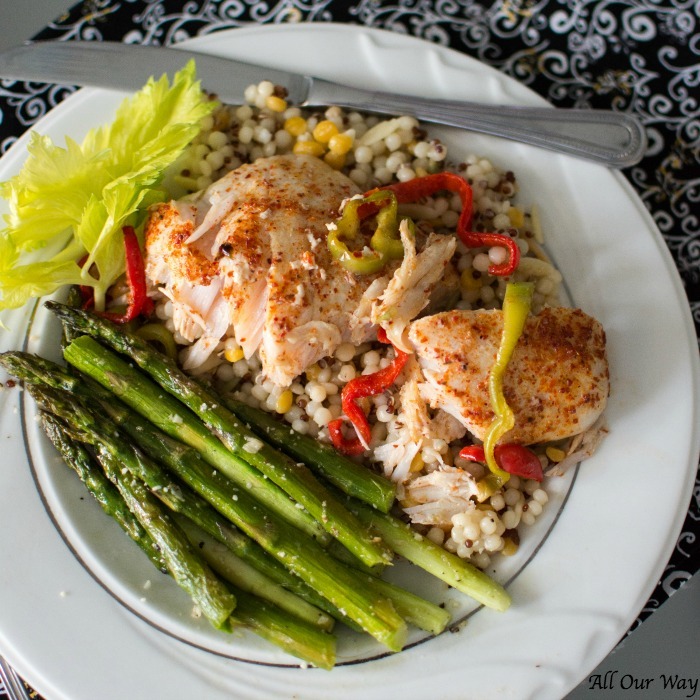 Asparagus is a favorite of ours so I definitely will be trying this recipe. Thanks! I love asparagus but it’s do expensive here. So it’s often just a treat food. I love roasting them as a side too. Lemon and garlic sounds perfect. Asparagus can be expensive here too, Veena. We just take advantage of the good price when they are bountiful. Marissa – this asparagus looks and sounds absolutely delightful. Fabulous start to spring!! Hello, Dené! Yes, indeed, asparagus is a great way to start the season. Ciao, Chiara! Asparagus has always been one of our family’s favorites. Abbracci! Asparagus was on sale at Aldi the other day so I picked up four packages. I was just wondering what I should do with it. Yay!! You’ll love the recipe. It makes the asparagus taste so fresh! Happy Spring, Pam! Hi, Stephanie! Don’t get those shoe-string thin asparagus peeling won’t work and they really aren’t that good. You’re forgiven for the 1/3 waste, Amy. I used to do the same until mamma corrected me. Now I feel as if she is right behind me waiting for me to grab the peeler and shave away. Hello, Kelsie! Happy spring! Yes, indeed, roasted asparagus with parmesan can’t be beat. Oh how I absolutely love asparagus! I could eat the whole bunch by myself! I love adding lemon to mine too and then you bumped it up with the garlic. Genuis and delicious! and the parmesan is a must! YUM! Hi, Megan! Try the garlic — it adds a whole other dimension to the asparagus. YUM!! Perfect timing. I have a bunch of asparagus in the refrigerator, Going to make your recipe with them It looks so refreshing. Hi, Jovina! Let me know how you like the recipe. Our Farmer’s Market down here are selling bunches for $1.48. I think that’s pretty cheap! Good morning, Marisa, Good minds must think alike……I’ve been on a asparagus kick the last couple of weeks….In season and priced inexpensive for this time of year….I just made asparagus crab leek soup. I still have two bunches of asparagus in refrigerator that will be roasted in oven this week. Thanks, for another super recipe…..love the quick, easy and delicious sides. Hi, Susie!! I’m in the mood for soup! We just don’t have our utensils to do anything more than a meat and a side. Your asparagus crab leek soup sounds delicious! Will you share the recipe? Happy first day of spring! It was great talking to you. Love you! Mothers … they do get into our heads sometimes. But Oh! The tricks we can learn from them if we only listen. Lovely asparagus dish … so full of springtime! I love roasted veg!!!!! It is the best way to eat vegetables, they just taste better when they have taken a stay in a hot oven!! Hi, Claire! Okay, you’re forgiven. 🙂 You used the ends and didn’t toss them in the garbage. The same trick works with broccoli and their woody stalks. And you are right. Roasting just adds another dimension. Hi, Molly! I do hope you make the recipe. It’s really easy and the oven does the cooking part so you can do something else. Have a great week – oh! Happy spring!